First aid kits are a legal requirement for every workplace. It must also be clearly marked in a green box with a white cross on it. Your staff should all be made aware of where their nearest first aid box is located; it should be easily accessible for people and the contents should be checked regularly to make sure all items are in stock and in date. It is important to remember that accidents and illness can happen at any time. First aid provision needs to be available at all times people are at work. Vehicle First Aid Kit - It makes sense to have a Vehicle First Aid Kit on hand for accidents you may come across while traveling on the road. You may need to deal with injuries ranging from bruises, cuts and scrapes, to moderate injuries, such as broken bones. Then there are the more serious, life-altering injuries like severe bleeding, or even an unconscious person where you may need to do CPR. Be prepared. If you have not done a First Aid Training Course, strongly recommends that you either do a course in your local area or online. A basic first aid kit doesn't need to include every piece of First Aid equipment although it might as well have basic yet useful content. So what do we suggest goes in a basic first aid kit? Basic first aid manual - one that is easy to understand. Sometimes it's hard to remember what to do in an emergency. A pocket-sized manual comes in handy, taking you step-by-step through first aid care. We think it is best to read through it so the layout and contents are familiar before you need it in the heat of the moment. Antiseptic wipes or gel - for cleaning your hands before touching open cuts and wounds. Instant Cold Pack/s - These are so useful for burns, bruising, swelling and sprains. They are single use, so if you have space grab a couple for your kit. Band Aids - a variety of shapes and sizes for small cuts and scrapes. I find the long strips of cloth tape with the padding in place already is great because you can cut it to size. Tweezers - A good pair of tweezers has easy-to-grip handles and can be used for splinter removal and other first aid procedures. Do not bother with a poor quality pair that will not grip a splinter you are trying to pull out as you will just get frustrated. Pain Reliever Capsules or liquid (liquid is best for children who can not swallow tablets). Anti-histamine - tablets or liquid (again for those that can not swallow tablets). Stings and Bites Cream- I prefer one with a local anesthetic especially for the kids. My son scratches his bites when he is asleep and ends up with bleeding and weeping sores so knocking out the itchiness of bites before he goes to sleep reduces the scratching. When an accident or injury occurs you may not have much time to read a manual while trying to give first aid to an injured person. We at First Aid anywhere recommend you do a First Aid Training Course to learn what first aid challenges you may encounter and how to treat them. Antibiotic Ointment or powder- Individual packets. Anti-microbial Hand Cleaner - Water less: They make water less hand cleaners in individual packets. Bring five or six. There are small bottles of Anti-microbial gel as well. Stern-strips (Butter-fly sutures, Adhesive Sutures, Adhesive Closures) - used to pull a small gaping cut or wound together. Consider packing these items in separate strong zip-lock bags. The reason is you will need to stuff all these items into a small bag -as mentioned above- it is very useful to use one bag for each 'type' of item such as gauze in one bag, medication in another and medical tools (scissors and tweezers) in another. Then when you pull out the items from the main bag they do not all tumble out and end up in a mess on the ground. This will not instill confidence in the person you might be helping. Last thing, you may not have much time to read a manual while trying to give first aid to an injured person or yourself. We recommend you do a First Aid Training Course to learn what first aid challenges you may encounter and how to treat them. on hand in case you are involved in or come across an accident. 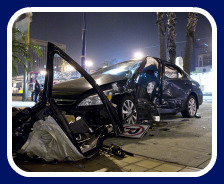 Car accident injuries range from... minor injuries, such as bruises, cuts and scrapes, to moderate injuries, such as broken bones. 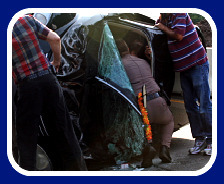 Then there are the more serious, life-altering injuries, or even fatal injury. We have put together a Vehicle First Aid Kit Checklist. Use it as a starting point and adapt it to your specific circumstance, needs of passengers, locations you travel to and through as well as weather conditions. A good First Aid Book - including basic CPR instruction. Antihistamine - for mild allergic reactions. Antiseptic gel (the no need for water type) - for cleaning your hands before touching open wounds. Antiseptic wipes - for wiping over small wounds, cuts and scrapes. Aspirin or other pain relievers - what you would normally take for pain. Burn gel with Aloe Vera - Aloe Vera aids in healing, pain relief has anti-inflammatory properties helps prevent blistering and scarring. Stings and bites cream - I prefer one with a local anesthetic especially for the kids. Hydro-cortisone cream - for skin inflammation and rashes. CPR Mask - learn how to perform CPR before you need it for real. Gauze and non-stick dressing pads - preferably sterile. Gauze squares - for either applying cream, gels or antiseptic or for putting pressure on and absorbing blood from bleeding wounds. We prefer not to use cotton balls as the fibres can get left behind in the wound and may cause trouble later. But if that is all you have go ahead and use them as they are better then nothing. Triangular bandage - For slings, padding, strapping fractured limbs to splints if a fracture is suspected. Band aids - a variety of shapes and sizes for small cuts and scrapes. Instant cold packs - The kind you snap to make it cold. These are so useful with bruising, swelling and sprains. They are single use, so if you have space grab a couple for your kit. Synthetic gloves: Put in a few pairs of these. Moist towelettes/wipes - for those times when you need to clean dirt or mud etc off someone or something. Saline solution - for flushing wounds and eyes. Sunscreen/Insect repellent - to prevent sunburn and insect bites when that picnic or football game goes just that bit longer. If going on a long trip take a thermometer. Torch - the shake or wind up type so you do not need batteries. Tweezers - good quality ones. The cheap quality ones often do not do the job and are therefore frustrating. Mobile phone - most people have one these days but worth mentioning. Any prescription medication that your child might be taking including asthma inhalers, epi-pen or allergy medication. Children's pain reliever liquid if they have trouble swallowing tablets. Children's-strength liquid decongestant - again if they do not swallow tablets yet. A tackle box or art-supply box works well for storing Vehicle First Aid Kit supplies. They are lightweight, strong for when it gets knocked about, have handles for easy carrying, and generally have trays or swing out sections for storing small items to keep them in order. Using clip lock bags to store certain items in to categories is a great idea so things can be found in a hurry. If going on a long trip remember to pack in your bags any prescription medication you or other passengers are taking. Whether it be for asthma, allergies or some other aliment because a pharmacy/drug store may be quite a distance away. When an accident or injury occurs you may not have much time to read a manual while trying to give first aid to an injured person. We recommend you do a First Aid Training Course to learn what first aid challenges you may encounter and how to treat them.